Chinese authorities in the troubled northwestern region of Xinjiang on Thursday shot dead one man after an attack on a police patrol left an officer seriously injured, according to official media. An exile group said at least a dozen Uyghurs have been detained at random for questioning over the incident, which was apparently sparked by police insults on the ethnic minority group. “Police shot dead one assailant and captured another,” the official Xinhua news agency reported, citing a police statement. “The attack occurred at about 1:20 p.m. in the city of Aksu when police checked a suspect vehicle based on a tip-off from residents,” it said. Police fought back after one auxiliary police officer was seriously injured, the agency said. The Germany-based World Uyghur Congress (WUC) exile group said that the two alleged assailants were among the mostly Muslim Uyghur group who complain of oppressive Chinese policies and strict religious controls in Xinjiang. An Aksu city resident told RFA’s Uyghur Service that the Uyghur who was shot dead was a boy. “It seems like he was tussling with the police. We also heard that one police was stabbed in the arm,” the resident said, quoting a neighbor whose brother-in-law is a police officer. The incident occurred at the Dashizi city center, the source said, adding that the “situation is very tense and they are also searching for bearded people” in reference to the mostly Muslim Uyghurs. The violence is the latest in a string of deadly incidents linked to unrest in Xinjiang, home to the Uyghurs, who are being targeted in nationwide security sweeps, the WUC said. 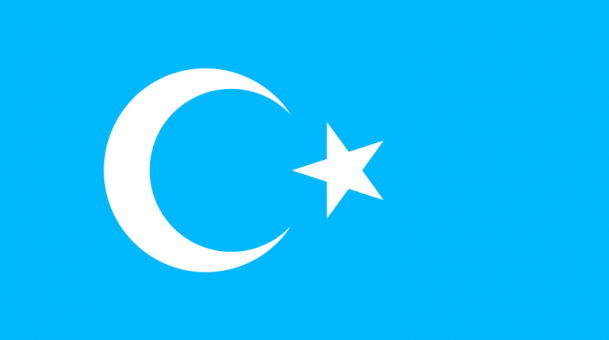 “According to local information, at least 12 people have been detained by the authorities, all of them Uyghurs,” WUC spokesman Dilxat Raxit told RFA. “Seven of them were detained after the incident, while the other five were Uyghur youths who were detained for filming the incident on their cell phones,” he said. He said the two alleged assailants were also Uyghurs. Raxit told Reuters the incident was sparked by police “insulting” Uyghurs during a security check. “One Chinese armed security officer was injured and at least two police vehicles were burned during the incident,” Raxit said. An officer who answered the phone at the Aksu police department declined to comment, however. “Sorry, I have no comment on this situation,” the officer said, before hanging up the phone. An employee who answered the phone at a shop in downtown Aksu said the area around the incident was quieter than usual. A police officer in the Toqay police station close to Aksu city denied reports that the Uyghurs had thrown explosives at police cars. Raxit said he had strong doubts about the official version of events, which he said came against a backdrop of hard-line security measures based on ethnicity. “Many of these kinds of clashes in the region are triggered by armed security personnel who specifically target their house searches and security checks at Uyghurs,” he said. “Once more, I call on the Chinese government to cease targeting Uyghurs with these…discriminatory and oppressive policies,” Raxit said. Uyghur Net, a Uyghur language website, said that based on its own investigation the Dashizi incident was triggered by a security check on an out-of-town bus. It said that several Han Chinese policemen had “violently” searched a young Uyghur passenger, resulting in him protesting against the action. “The police shot him on the spot. Another Uyghur youth could not bear the situation and attacked the police with his knife. One of the police officers was wounded and the attacker detained,” the report said, adding that all of the Uyghur travelers on the bus had been detained and taken to the police station. On Wednesday, authorities in the southern province of Guangdong stepped up security patrols in the wake of a knife attack that injured six people at Guangzhou’s railway station on Tuesday. The Guangzhou attack came just days after a knife and suicide bomb attack left three people dead and 79 others injured at a railway station in Xinjiang’s regional capital, Urumqi. That attack was blamed on “religious extremists,” one of whom was a Uyghur, judging by the name reported by official media. However, rights groups and exiles point to heavy-handed rule by Chinese authorities in Xinjiang, including curbs on Islamic practices and the culture and language of the Uyghur people. China has seen 10 “terrorist incidents” in the past year that killed more than 30 people, including police officers, the official news agency Xinhua said, reporting on an official “blue paper” on terrorism released on Tuesday. But political analysts said China is facing the consequences of decades of growing social inequality and hard-line suppression of government critics among ethnic minorities and Han Chinese alike. Reported by Yang Fan for RFA’s Mandarin Service, Bi Zimo for the Cantonese Service and Eset Sulaiman for the Uyghur Service. Translated by Luisetta Mudie, Mamatjan Juma and Eset Sulaiman. Written in English by Luisetta Mudie and Parameswaran Ponnudurai.